The proFPGA XC7VX330T FPGA module is the logic core and interface hub for the scalable, and modular multi FPGA Prototyping solution, which fulfills highest needs in the area of high speed interface verification and test. It addresses customers who need a high performance ASIC Prototyping solution for early software development and real time system verification. The innovative system concept and technologies offer highest flexibility and reuseability for several projects, which guarantees the best return on invest. 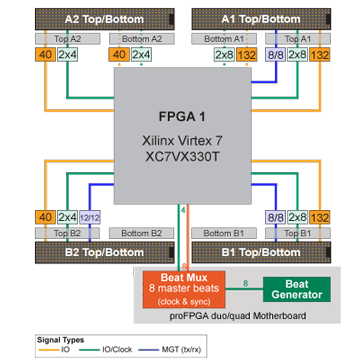 The proFPGA XC7VX330T FPGA module, which only works in combination with an proFPGA duo or quad motherboard offers with its latest Virtex 7 FPGA technology medium capacity of up to 2 M ASIC gates in one FPGA. It is designed to achieve highest performance in combination with its high speed interfaces and connectors. The module offers with its 6 extension sites up to 540 user I/Os for daughter boards (e.g. memory boards, interface boards), interconnecting cables or customer specific application boards. The highlight of this module is, that it offers beside the standard I/Os 28 high speed serial transceivers (MGTs) for high speed interfaces like PCIe Gen2, Gen3, USB 3.0, or DDR3 memories. All of the 6 extension sites offer individually and stepless adjustable voltage regions from 1.2V up to 1.8V. One extension site also offers up to 3.3V.